Flower Day was celebrated at Earlston school, Gowangardie South, on Saturday last as a result of which the fund for the repatriation of their local soldiers will benefit to the extent of over £11. At 3.30 a large gathering of district residents and friends assembled at the school. Cr Gordon Henderson, who presided, stated that there were several objects of the gathering that afternoon, but the main one was celebration of Flower Day, which was being held this month by schools all over the Commonnwealth together with the unveiling of the Earlston school Honor Board of scholars who went to fight our battles. They were pleased to have their Federal Parliament representative with them, who would unveil the honor board and also speak on repatriation. Later on the Rev Fentonby, Methodist minister at Euroa, would say a few words. 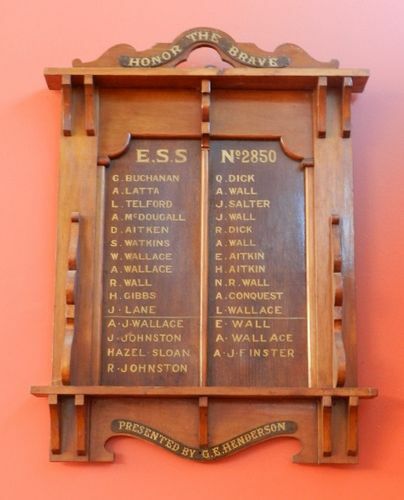 He had to apologise for the absence of the Shire President Cr Johnston Wilson, and also Mr Macdonald, who had only returned to Violet Town that day. "Salute the Flag" was nicely sung by the children, under the direction of Miss Moysey, head teacher ; Miss Jean Henderson, pianist. Euroa Advertiser (Vic), 6 December 1918.